Beckman Coulter Avanti J-25 High Speed Refrigerated Floor Centrifuge 25,000 RPM . New Life Scientific, Inc. 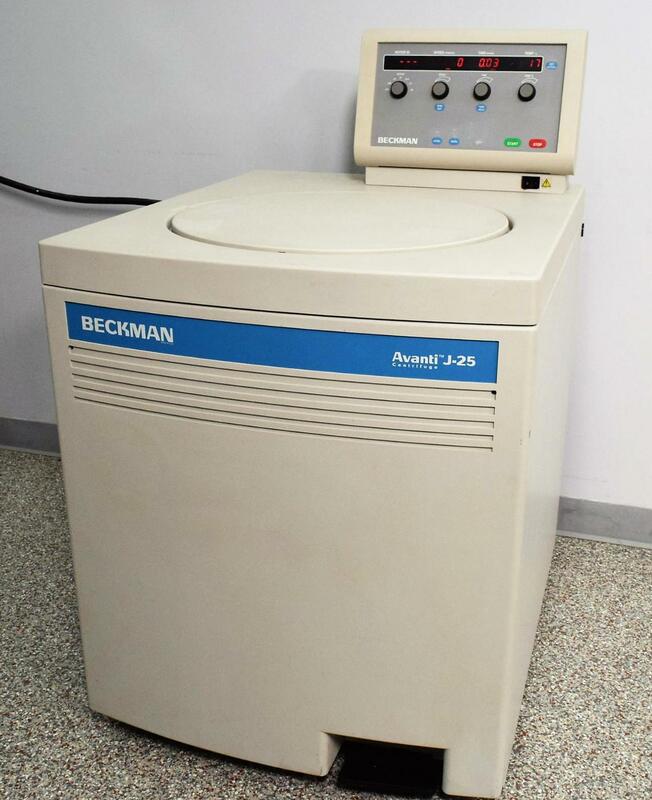 This Beckman Coulter Avanti J-25 high speed refrigerated floor centrifuge is in great physical condition and reaches both the manufacturer speed and cooling specifications. This centrifuge will require you to provide a rotor before use. No rotor included means you don't pay for a rotor that you don't need! Our technician tested this centrifuge to its maximum speed of 25,000 RPM. The chamber reaches -20°C when idle and holds at 0°C during the run. No problems or unusual noises were detected during tests. This is a 208v unit, but the transformer can be rewired for other voltages. Our in-house technician removed dust and cleaned the inside of the centrifuge as well as cleaned and greased the vacuum seals. New Life Scientific is no stranger to centrifuges. Over the past four years we have dealt in and worked on a wide variety of benchtop and floor centrifuges from the top manufacturers, including Beckman, Sorvall/Dupont/Thermo, and Eppendorf. You can have confidence in our technical evaluations and our warranty knowing that we have actual in-house technicians who inspect, test, service, and repair centrifuges. After their examinations and being cleaned inside and out, they often leave our shop meeting manufacturer specs. We provide after-sales support for any questions or issues that may arise, and even after your warranty expires we’re still around to help you out. We realize that buying pre-owned can be unnerving, so we include a 90-day warranty on our centrifuges to protect you against any equipment failure or defects. If anything goes wrong, our in-house support is only a phone call away. 28 x 34 x 45.5 in.